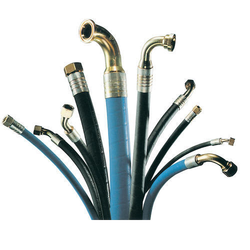 We are one of the major manufacturers and suppliers of Hydraulic Hoses. The offered hoses are made using sophisticated RUBBER and allied raw materials coupled with cnc machined nut sae ,ansi flanges in carbon steel, stainless steel, brass and other special material and compliance with set industry standards. These products are highly acclaimed among our valuable clients owing to their optimum quality and cost-effectiveness. 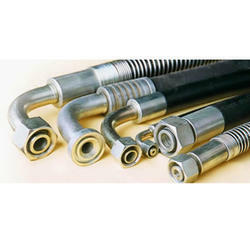 High Pressure Hydraulic Hoses are assemblies made from parker hose as per sae, din & en specification. high pressure multispiral hose assemblies with interlock fittings with various guards are available. Looking for High Pressure Hydraulic Rubber Hose Assemblies ?